Community Social Service Worker Kara Dooley with participants in a 2009 project that brought Ugandan traditional healer stogether with representatives from the medical community to find ways of working together to better serve patients with mental illness. When Kara Dooley joined the Community Social Service Worker (CSSW) Program, she never expected that her journey would take her from Uganda to Australia and now to a major international conference in Hong Kong. This week, Dooley is presenting the findings of a research project she conducted during the 10 weeks she spent in Uganda in 2009 as part of the CSSW program’s Uganda Project in front of an audience of professionals, academics, practitioners, social planners, policy makers and advocates at the at the 2010 Joint World Conference on Social Work and Social Development. CSSW instructor John Fox, who will co-present with Dooley, says it is rare for a diploma graduate to be accepted to present at a conference of this scale, which is attended by top researchers from around the world. While in Uganda, Dooley worked with the national mental health program to explore ways of linking traditional healers who provide health care for people in villages and rural areas with the formal medical system. 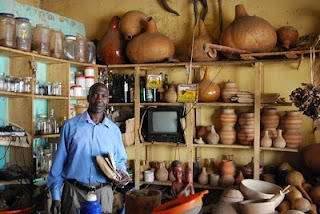 A Ugandan traditional healer in his shop. Dooley hopes her presentation will raise awareness of the clash between traditional and western medicine in Uganda and Africa as a whole, particularly when it comes to mental health issues. More than 80 per cent of Ugandans live in villages and small towns where few formal mental health or medical services are available and depend on local traditional healers for health care services. As for this week’s conference, Dooley says she has the jitters under control.